Cast: Fujiwara Tatsuya, Okada Masaki, Shida Mirai, Kubota Masataka, Miyake Hiroki and Ashima Sei. 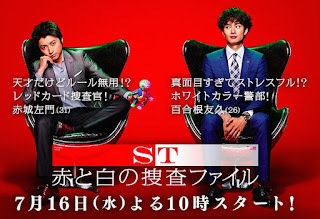 Back as a team under the name ST (Scientific Taskforce) where Yurine Tomohisa (Okada Masaki) still is the Captain of the group of ‘outsider’ police officers. When the director of the police force leaves, the only support for the ST team disappears, and a new director arrives and she does not like the team. Besides the fact that the ST team is rude and arrogant, the team leader Akagi Samon (Fujiwara Tatsuya) takes the cake by being the most ill-mannered and offensive of the bunch, and it’s the Captains job to keep him decent - which Yurine exceeds in more than anyone. And surprisingly the Yurine seems to fit in the group well, which creates a well-functioning duo and a harmony to the team. This is actually the first drama, of the year, in which I couldn’t wait till next week’s release. Not that the drama was THAT exciting, but I really looked forward to every single episode. And about the storyline, it’s great, nothing boring at all. The cast was brilliant on the other hand, might be the real reason for me to watch it, especially the confusing yet bromantic duo: Akagi and Yurine (Fujiwara Tatsuya and Okada Masaki). Talk about great acting! The two really are great actors, and they really are good at acting opposite each other! I rather not spoil this, because I really think it’s a worthy watch, and recommendable! Eh? What? Why? Was that the ending? I’m so confused right now. I have been watching this for quite a while now, maybe half an episode everyday, but I managed to finish it. It’s not boring, nor bad, I’m just the stressed out student with all my exams. This drama was good, a typical genius-detective-solving-crimes Japanese drama with a little sprinkle of bromance, very cute! Captain and kurosaki are eye candys, it’s an interesting show to learn about psychology and murder mysteries. Ten episodes only and no romance but great show. Ps. Just found out there is movie coming up, the grand finale, maybe that’s why it ended like that.